Sevim Çelik, a Turkish teacher who gave birth to a baby in Ankara on Friday, was reportedly detained later the same day over alleged links to the Gülen group, which is accused by the Turkish government of masterminding a failed coup attempt on July 15, 2016. 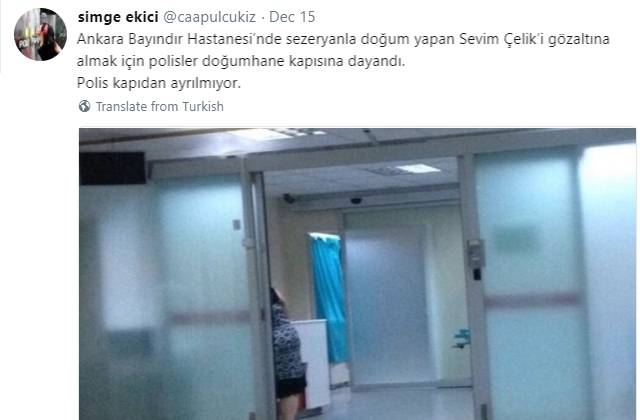 According to the Twitter account @caapulcukiz, police came to the Ankara Bayındır Hospital several hours after Çelik gave birth to her baby in order to take her to a police station in Ankara for interrogation. Similar allegations have been made by several other Turkish journalists and Çelik’s family members on Twitter. This is not the first-time Turkish police detained a woman shortly after giving birth, as part of an ongoing investigation into the followers of the Gülen group. In May, Aysun Aydemir, an English teacher who gave birth to a baby in an elective cesarean procedure, was detained at the hospital and subsequently arrested by a court and put in pretrial detention with a 3-day-old baby in Zonguldak province as part of the investigation into the Gülen group. In late January, Fadime Günay, who gave birth to a baby, was detained by police at Antalya’s Alanya Başkent Hospital. Ey insanlık ses ver artık! Ne zaman vicdanın harekete geçecek? Ankara Bayındır Hastanesi’nde sezeryanla doğum yapan Sevim Çelik’i gözaltına almak için polisler doğumhane kapısına dayandı.